Let me start by saying that I loved this book and I devoured it like a little kid on Halloween night. I finished it and felt a little sad because I wanted more, it is ironic that I consumed a book named Chasing Slow so quickly. This is not a how-to book, this is a beautiful story of Erin’s life so I’d put it in the inspirational memoir category which made the storytelling rich and fulfilling and had me nodding that her thoughts and perspectives could be mine too. If you are feeling a little lonely: this book will give you great company. There’s a thread in this book that really spoke to me. As the title suggests Erin is on a path of Chasing Slow, living with intentions and seeking flow (ME TOO and Jess Lively is THE lady to talk to about this – she’s got two free webinars coming out this week and I urge you to check them out.) and yet there is this thread of entrepreneurial spirit, pure ambition, and curiosity in the great experiment of life that keeps drawing her attention away from slow. I half wanted her to find the perfect equilibrium of slow ambition because I deeply want a model for how that looks…but I see how the ebb of all of this and how there is not a resolution is even more perfect because as aspirational as that might feel it’s not all that realistic. Can I plant a Red Wood tree? I’ve got to order some seeds because there is just one way to find out. Should I try the pixi haircut again. I’m leaning towards no because I really love a pony-tail and I hate lipstick but this book had me craving it. Is there ever a set-point where chasing and the slow meet? I have a feeling it’s fleeting but I bet it feels like that moment you’re lingering on a see-saw and you feel weightless. I loved it. It made me laugh and cry and relate and that all felt so very good. Put it on the list of things you read as you’re in your winter hygge mode. Created by Cass McCrory Subtraction Project is all about cutting the excess so life adds up. We all have too much stuff. In our homes, on our to-do list in our brains and we need to let some of it go. If it were easy we'd do it all on our own. It's not easy. So we do it together. 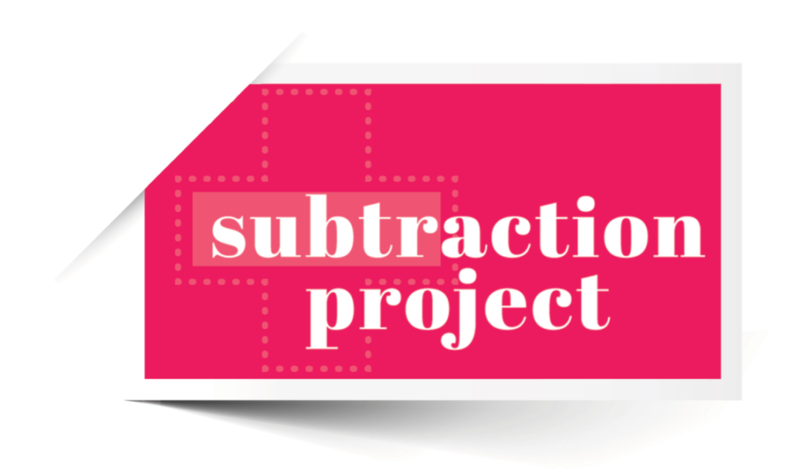 That's what the Subtraction Project is all about.